The "Mirrico" Group has developed a new method for cleaning tanks and oilfield equipment, followed by phase separation of extracted sea-floor sediments - a MARTin mobile autonomous robotic unit. Robotic technology and equipment allows to perform unmanned cleaning in shorter periods of time, while processing of extracted oil sludges allows not only for multiple reduction of the amount of oil waste, but also for preservation of oil product contained in the oil sludge. The equipment can be used in the cleaning the railway tanks, sludge collectors in oil refineries, as well as tank farms of oil and gas producing companies. In case of need, "Mirrico" Group can produce a MARTin mobile autonomous robotic system for the conditions and requirements of the Customer for sale with subsequent warranty service and training the Customer for the operation and repair of the equipment. The ability to receive information about the progress of work online anywhere in the world. 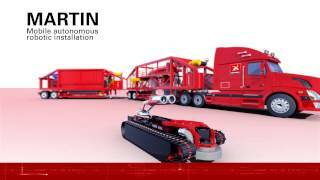 MARTin mobile autonomous robotic system from the "Mirrico" Group is designed to clean containers and devices up to 50,000 m3 with subsequent processing and utilization of the extracted settlings. MARTin system consists of three blocks, each of which can be packaged with different equipment, based on the requirements and conditions of the customer. The fourth block for the disposal (neutralization) of oil waste and water treatment is under development by the "Mirrico" Group. Upgraded mobile 20-foot marine container equipped with lighting, heating and air conditioning systems. The container is divided into two compartments (an operator compartment and a compartment for storage and transportation of auxiliary equipment). The operator compartment is equipped with the operator's working place, systems for control of robotic devices, video surveillance and warning. The compartment for storage and transportation of auxiliary equipment is equipped with a hydraulic station, a place for placement of a robotic cleaner and robotic gun, as well as auxiliary equipment (hoses, hydraulic trap, nozzles, flow meters, etc.) and instrumentation and automated control systems. All the equipment is certified and fire-flame-proof. The equipment is placed at the 12-meter trailer and is equipped with a process vessel including a heat exchanger, washing pump, level sensors, etc. The room also has lighting, heating and air conditioning systems and allows to work at a temperature from -30 to +45 ° С. The basic set includes various equipment and devices (tanks, hydrocyclones, dehydrator, tricanters, pumps, agitators, scroll conveyors, electric diesel station, bandaging materials and instrumentation system). All equipment is located in a specially designed room, which in transport position has the dimensions of a 40-foot sea container located on its own chassis. In the operation mode, the container design allows to increase the useful area of the room in half by 15 minutes. The room also has lighting, heating and air conditioning systems and allows to work at temperatures from -30 to +45 ° C.
The basic complement consists of a modernized heat-insulated 40-foot marine design container, located on its own chassis. The container is equipped with a place for storage of additional equipment, spare parts, greases, tools, places for drying and storage of overalls, PPE. The room also has lighting, heating and air conditioning systems and allows to work at temperatures from -30 to +45 ° C.
The equipment is completely self-contained, no crane or tractor equipment and steam supply are required to install and start the unit. Only diesel fuel or electricity supply is necessary to operate the unit. 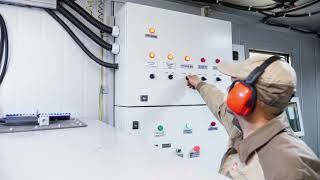 All equipment is certified and implemented fire and explosion safe. A new robot, developed by Russian company, Mirrico, could revolutionise the way that storage tanks are cleaned. Why are venture companies investing in Russian oil and gas startups? Corporations from Mexico, Iran, and Kuwait are interested in Russian robots for cleaning oil tanks, while companies from the U.S., Canada, and Sudan are already using ultrasound technologies for cleaning oil wells.